Elephant ears (Colocasia) are wonderful perennials but many are marginal her in Zone 7. With some careful planting, you can prevent the dreaded winter rot that occurs when planting. The first thing to keep in mind is to select the type that can survive here in Zone 7 because they don’t all make it here. Even the marginal variety can rot mid way through winter if not planted in the proper place. 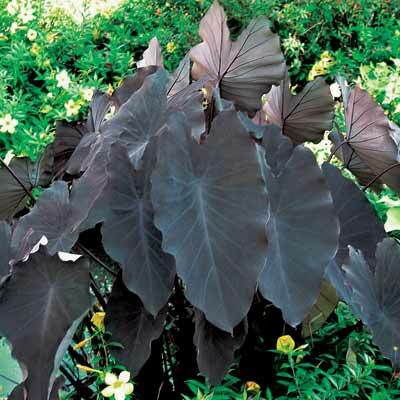 The Black Magic Colocasia are a great example of such variety. Other than selecting the proper variety, the most important thing for success is to select the planting location. The ideal planting location for assured survival is next to structures, side walks, driveways, concrete patios, etc. Such structures are a source of warmth that help keep the soil from freezing thus preventing the cold wet rotting conditions. Planting in a wide open area without this source of warmth is a sure fire way for your Elephant Ear bulbs to turn to mush. The next key, is to plant them at the correct depth. Planting them under a minimum depth of about 4″-6″ will help greatly in preventing rot. One thing you will discover is that these bulbs multiply rapidly! New bulbs will grow attached to the original and become larger in time. These new offsets begin to push up and after a while, some will start growing on the soil surface and become susceptible to rot. At that point, you want to dig up the clump and break some of the offsets off to prevent rotting. This is a great way to make more or to store for insurance in case your main planting doesn’t make. You can a rather large clump even after just 1 growing season! 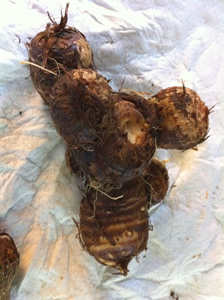 The clump you see here got this size from a single bulb in just 1 growing season. There are at least 5-6 offsets here that you can break off to create new plantings. The correct soil type is also important. In the summer, they like lots of moisture but in the winter, excess moisture is what’s sure to doom your bulbs. With this in mind, you want something that will retain moisture yet not be soggy. I’ve had good success with a mix of the inexpensive Evergreen garden soil from Home Depot/Lowes along with our native clay soil. You can also add some pea gravel or sand to aid in draining though that’s not absolutely necessary. Selecting an area that doesn’t collect a lot of water goes along way here, so this one kind of goes along with placement. Finally, you want to mulch well in the fall after the top growth has died which is usually after a frost or two. Do not use leaves for mulch! They get too wet and will surely rot your bulbs. Pine needles work well. I’ve also had great luck with pine bark. The key here is to provide insulation without excess moisture. A couple of inches is more than enough here in Zone 7. That’s it, with these few simple tips you can successfully grow marginal Elephant Ears here in zone 7 for many years!